With our expertise and trustworthiness, we are engaged in offering an optimum quality range of Watch Belt Making Machine. We are a top-notch organization, engaged in providing Belt Making Machines. Fault indicators: For any yarn breakages in warp, weft and catch threads. With through domain understanding, we are betrothed to provide Strap Cutting Machine. From our wide consignment, we are affianced in supplying Kansai 1508 Belt Making Machine. 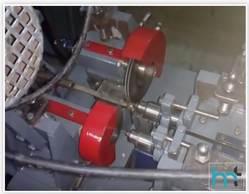 In order to meet excellent quality standards, we are supplying Belt Making Machines. From our wide consignment, we are affianced in supplying Belt Making Machines. We are amongst the most reputed names in the industry, offering Belt Making Machines. Banking on our enriched industry experience, we are able to supply Molding belt making machine.